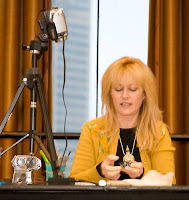 My first seminar of the day was Christi Friesen's Art Jewelry Designing. She gave each attendee a pen and a little booklet called "doodle your way to amazing wonderfulness or: how to design art jewelry without hardly trying," and encouraged us to scribble and doodle everywhere we go, even in her lecture. She showed how her inspirations lead to doodles and then to more detailed designs for her elaborate jewelry, although she said her finished pieces often vary quite a bit from her sketches. Then she told us her techniques for assembling her unusual shapes. Jana Roberts Benzon gave a very detailed demonstration on how to construct her breathtaking dimensional caned pieces and showed how dimension catches light, creates shadow, and results in interest and intrigue. To make it easy for everyone in the room to see what she was doing, she had a video camera pointed at her work surface and sent the image through a projector onto a big screen. I also liked her outfit and the little elf condoms she was wearing on her fingers. During the afternoon gathering, Tim McCreight got 200 grownups to play with little pieces of paper. His interactive presentation was called Design Decisions: Good, Better, Best, and he started out by challenging us to improve upon a design he put on an easel. Seth Savarick and Donna Kato were forced to do this in front of everyone. 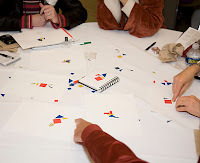 Then the people at each table arranged their pieces of paper and talked about their design decisions. Fun. My last seminar of the conference was Karen Woods "Unconventional Polymer." I was feeling a little sleepy but Karen's amazingly energetic presentation woke me up and k ept me fascinated all the way through. She had so much information to share that she talked a mile a minute and ended up quite out of breath. She showed us real items borrowed from other artists and lots of pictures of unusual and different ways of using polymer clay. In addition to looking outside the clay world for inspiration, she told us to "take a class in something you don't want to do," such as basket weaving or mosaic tiling or some other skill that might possibly suggest a use in clay. Kudos to all the people who put Synergy together. It was a wonderful experience for me, and everyone else I talked to seemed very pleased as well. Mahalo (thank you) so much for your insightful, charming, and informative journal of your Synergy experiences. I really hate to fly, so your posts help me to peek at such an awesome event, and your pictures are great! Cynthia, thanks so much for the postings on Synergy! Great insight. 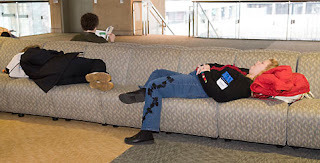 I'm planning on taking a workshop with Jana later this year so it was fun to see photos of her and her presentation! This is terrific Cynthia, not only are you fantastic at writing up your workshops (the BOH workshop you did last month was perfect!) but your Synergy reports are something to look forward to everyday. Thanks so much for the synopsis of the conference. It shared some of the flavour of what must have been an amazing time!